Trinity Designs: Easy, Breezy, Beautiful! I've got a busy, busy day ahead but I didn't want to miss a chance to share a new card project with you all - here is a card I designed for my hostess Sheli's party this month and we created it in my Just Cards classes yesterday too! 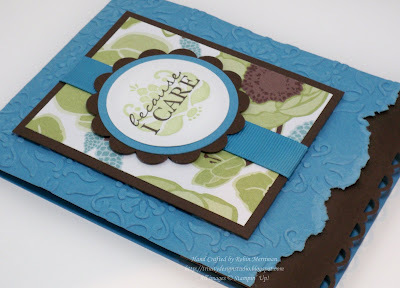 Everyone just loved it - the color combination is gorgeous and the best part is that it's a very simple card to create! The card base is Marina Mist folded lengthwise. I ran it through the Big Shot with the Vintage Wallpaper embossing folder. I LOVE the beautiful, deep texture this folder gives, it not only looks gorgeous, but just feels elegant! For this card, I tore a bit off the front and added a cardstock border of Early Espresso that was punched with the Scallop Trim Border Punch. All the layers on the card front are so easy to assemble. I used a piece of Greenhouse Gala matted with a piece of Early Espresso cardstock. These were wrapped with a piece of Marina Mist 5/8" Grosgrain Ribbon and popped up on Stampin' Dimensionals. For the focal point, I punched a piece of Early Espresso cardstock with the 2 3/8" Scallop Circle punch. It's layered with a circle cut out of Marina Mist with the Big Shot and my Circles #2 Die. The greeting is stamped on Whisper White cardstock with the lotus blossom stamp from the Friends Never Fade stamp set. I used Pear Pizazz ink and stamped off twice. 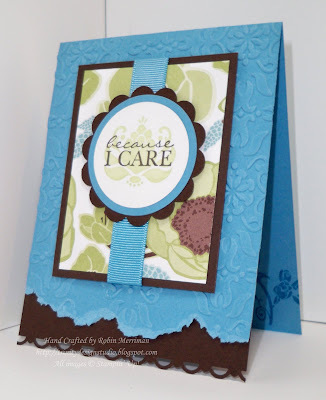 I added the words from the Because I Care stamp set in Early Espresso ink right over top and then punched it out with the 1 3/4" Circle Punch. You may have noticed a little floral image peeking out from the inside in the first picture. That image is also from Friends Never Fade and I just stamped it in Marina Mist ink to add a little interest there. The best part of this card is that you can make 12 of them with just one sheet of the Greenhouse Gala Designer Paper. Cut your paper in 3" x 4" pieces and you get 12 from one sheet! If you used this layout with that whole pack of designer paper you could make 144 cards with just one package! Now that's making the most of your supplies! Be sure to visit my Stampin' Up! Website where you can Shop 24/7 for all these supplies to make this card design. Remember, all online orders this month will receive a special handmade Thank You card from me! What a striking card Robin! Thanks so much for sharing! Awesome card Robin. I love that it uses the colours from the Getting Started kit, I'm going to case this for sure. Love the colours. It's a beautiful card and I too will be casing it if you have no objections.